I don’t know about you but after all the holiday food indulgence, I am detoxing. Yep, I am! Just for several days until that yucky bloated feeling goes away. Every time when I’m away from home, it’s so hard to eat healthily. I can see why some families vacation with a kitchen in their suite. It’s easier to prepare healthy meals while away, not to mention how much $$$ you save. So I wanted to start the new year with this recipe. Refreshing, healthy, light and delicious! Have a great week everyone. In a small bowl add avocado and juice of half a lime. Use your fingers to gently toss the avocado with lime juice; set aside. 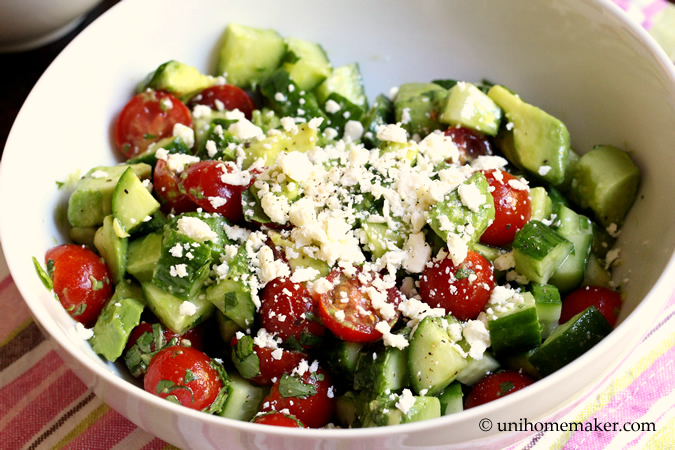 In a medium bowl combine cucumbers and cherry tomatoes. Season with salt. Then add mint, cilantro, avocado and extra virgin olive oil. Squeeze the remaining half of the lime into the bowl. Toss everything together and transfer to a serving bowl/platter. 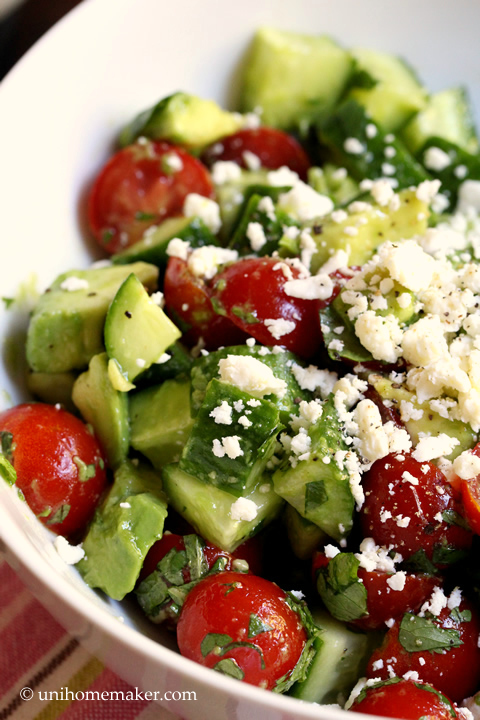 Top the salad with crumbled feta cheese and freshly cracked pepper before serving. 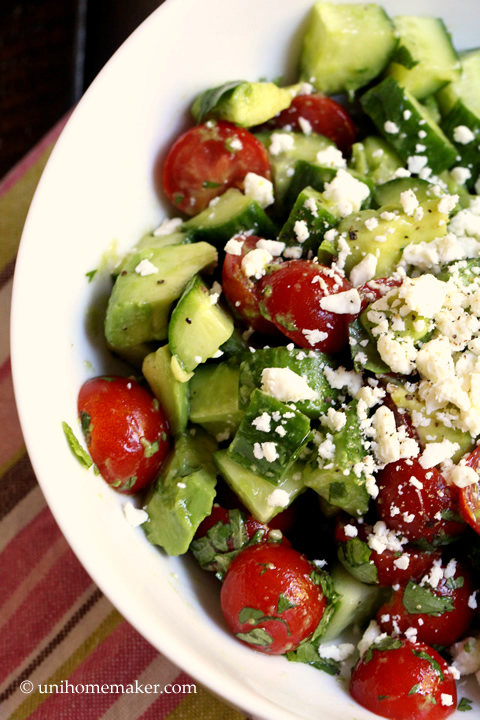 2014 is the year of the avocado for me so I welcome this salad! Who says healthy foods can’t taste good? Well, we all know that isn’t true but as a kid it’s a different story. I used to hate tomatoes and cucumbers, and the only time I’d eat avocados was when it was in guacamole form. I could eat a whole bowl of this now. I need this kind of healthy salad! After all the high fat and sugar I ate over the holidays, time to get back on the straight and narrow. This looks wonderful – thanks. Love love love! I’m doing the same thing right now until that icky feeling from travel / holiday goodies goes away! This salad sounds wonderful – some of my very favorite things are in here! Have a great week Anne! I like the added mint! Nice touch. Happy New Year Anne! I hope you had a nice trip! I hope you had a wonderful trip away, Anne, and welcome back! This salad looks so fresh and delicious, and I would love a big bowlful! As a kid, I hated salad and couldn’t imagine myself having it as a meal but I’m so happy I grew up and I can honestly say I love a good salad! This is refreshing and the crunch would be ever so welcome. It is definitely hard to eat healthy and in moderation when traveling. I still can’t really trust myself to portion control and it’s just so nice to get home and whip something something light and fresh like this after a trip to balance things out. Hope you guys had a fabulous anniversary celebration! Happy New Year and Happy Anniversary! And I’m totally the same way… I always write the wrong year on checks and documents for at least a month! Love this healthy salad idea! Can never go wrong with avocado! It has taken me a while to get back in the swing of things too! This salad looks delicious, I could definitely use more salads these days! What a beautiful and healthy dish to start the year. Happy New Year to you and your family, Anne! Happy Anniversary and Happy New Year! I know it is always nice to get away, but then getting back home is always good too. I find comfort in my routine. Beautiful salad – and happy anniversary! I need to detox too. This salad fits the bill. Happy new year and anniversary Anne! A perfect, healthy and colorful salad to start the year! I’m so glad to hear you were off having fun! This salad looks so healthy delicious and craveable! WOW this salad looks like a fab way to detox!! Yum – love the colors and flavors! A colorful salad is the perfect way to start the year! Love all the ingredients, looks so fresh and appealing! looks like a great new year healthy eating recipe! This is my kind of recipe, Anne! 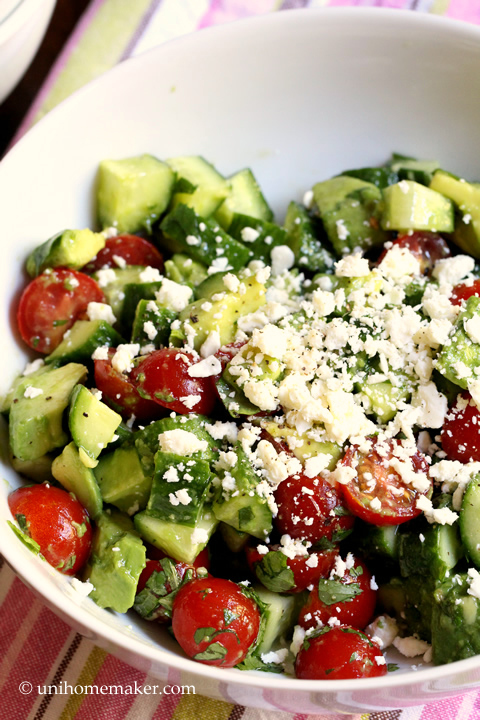 I’ve been making cukes, cherry tomatoes and feta with Greek seasoning, olive oil and red wine vinegar but I could go for a change! I love the avocado and cilantro in this. YUM! I might just have to go to the store tomorrow so I can get more cucumbers and tomatoes so I can make this. Pinned! Hi Anne, I love how fresh this salad looks…. I am craving vegetables lately and need to eat healthier! I love all the colors and photos too – pinning. Have a great week! A very yummy salad. This time of the year I’m all about salads! Can you imagine why? 🙂 Detox, right. Oh, yum! Anne, I could eat this salad right now for breakfast! (I haven’t eaten yet and it’s 7 a.m. already. Got up early to bake a cake!) Thanks for sharing, girl. A recipe we really need right now! Pinning! All I can say is, mmmmm…. 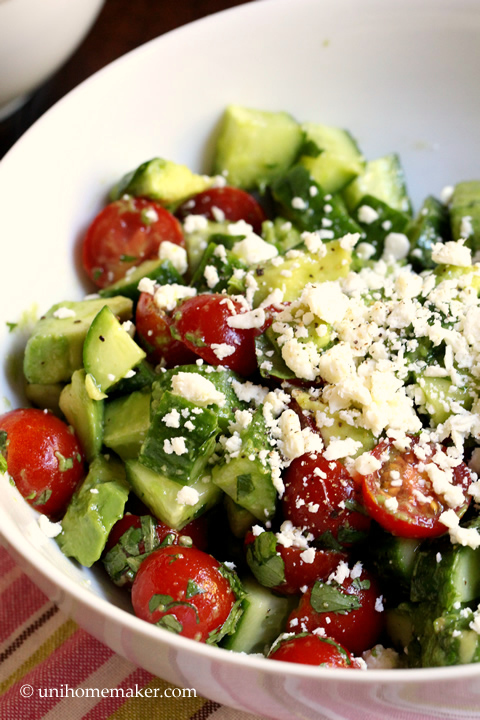 I am definitely adding this salad to my lunch menu this week!! It looks delicious, refreshing and energy boosting! Thanks for the recipe Anne!! Looks delicious:) I’m embracing all things tomato as the variety and quality of tomatoes here has just boomed recently! Yum! Healthy, boosting salad like this is really great! It can serve 2 appetizer serving for this. You can definitely serve this as one serving but it’ll serve generously.